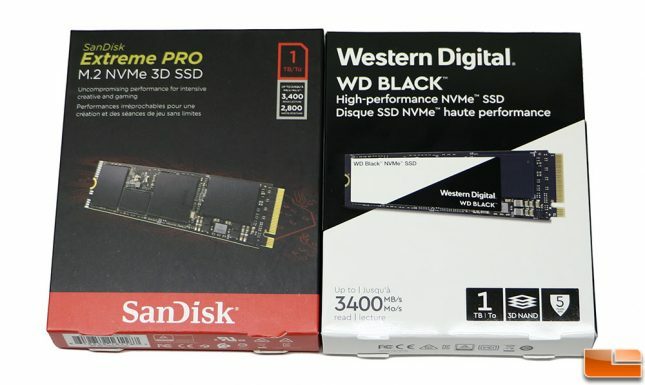 The SanDisk Extreme PRO and Western Digital WD Black NVMe are available in capacities of 250GB ($119.99), 500GB ($229.99) and 1TB ($449.99). The flagship 1TB model has sequential read speeds of up to 3,400 MB and write performance up to 2,800 MB/s. The Random Read 4K performance on the same drive is up to 500,000 IOPS read and 400,000 IOPS write. Those are impressive speeds and the pricing is aggressive at $0.45 to $0.48 per GB. For comparison sake, the Samsung SSD 960 PRO series has sequential R/W (read/write) speeds up to 3,500 MB/s and 2,100 MB/s respectively and is priced at over $0.60 per GB. WD has a drive here that is hopefully going to compete with the best on the market, so whether you are a PC Gamer, enthusiast or a power user we hope that you keep reading and see how this drive performs. Western Digital’s new controller architecture means that the company has in-house development from the controller to the NAND. This gives WD tremendous design flexibility and they believe this new PCIe Gen 3 x4 controller is scalable and future-ready (think QLC NAND). 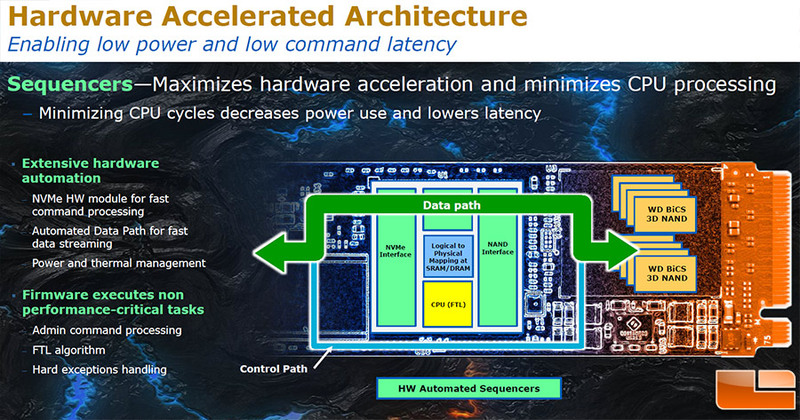 Since WD designed everything they were able to design for low power and low latency as well as general performance. 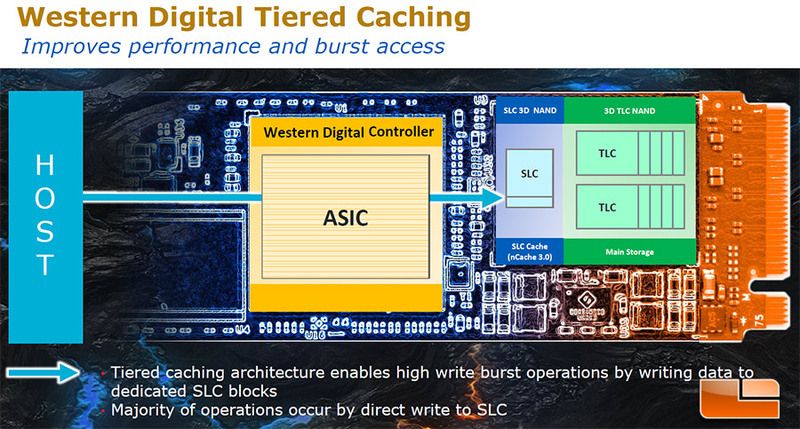 WD’s new controller has three cores, is built on the 28nm process, features nCache 3.0 (marketing term for SLC Cache) for enhanced burst speeds, multi-gear LDPC (low-density parity-check) and hardware ECC to provide full SRAM and DRAM bit correction. 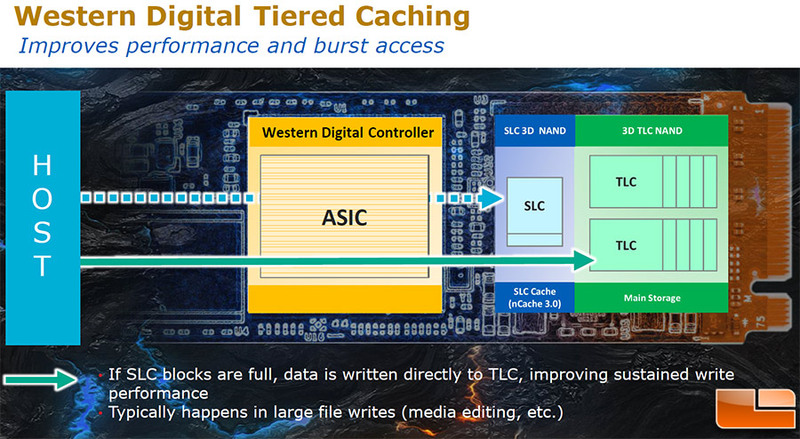 Tiered caching allows burst write operations to the dedicated SLC blocks and when the blocks are full data can be written directly to the TLC NAND. 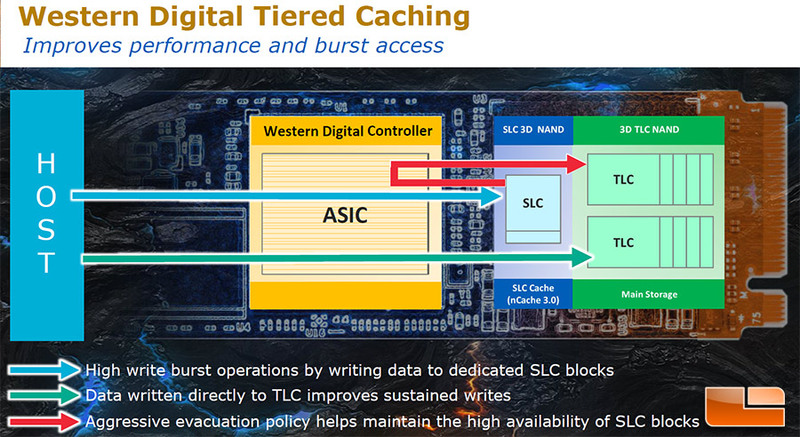 The WD Controller architecture uses an aggressive evacuation policy to keep the SLC blocks free for peak performance. You can see some slides about the controller below if you are interested in hardware automated sequencers and tiered caching. One thing that we should point out in this review is that the full name of this drive is the Western Digital WD Black NVMe SSD. That looks a little funny, but Western Digital is the brand and WD Black is the product name. Since both the WD and SanDisk versions are the same we’ll only be focusing on the WD branded drive for the remainder of the review. It should be noted that the 250GB model is only available as a WD Black branded drive and will not be available under SanDisk Extreme Pro. The drive that we will be testing for this review is the Western Digital Black NVMe SSD 1TB model that is sold under part number WDS100T2X0C and has a $449.99 MSRP. For that price, it comes with Acronis True Image WD Edition for data cloning and backing up your operating system as well as WD SSD Dashboard software for drive management. The WD Black NVMe 1TB SSD has an endurance rating of 600 TBW when it comes to lifetime writes. That works out to meaning that you can write roughly 328.8 GB of data to the drive per day over the 5-year limited warranty period. 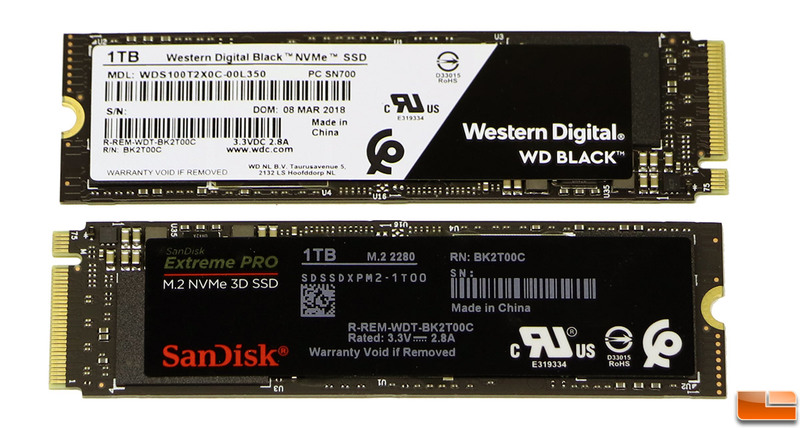 The Western Digital WD Black NVMe SSD series looks pretty much like any other M.2 2280 ‘gumstick’ drive. You have black PCB with a sticker covering all the major components. Under the label there you’ll see a rather unique layout. You have the WD controller in the middle, the DRAM cache located next to it and then on the outside edges of the drive you have the two SanDisk 64-layer BiCS3 3D TLC NAND ICs. The back of the single-sided PCB is bare with no spots available for additional components. Let’s take a look at the test system we’ll be using and then jump into the performance numbers on a handful of popular benchmarking utilities that you can run at home to see how much faster this drive may be than what you currently have.